Built with the intention of immediate sale, this new apartment’s open-plan kitchen was designed to suit the lifestyle of those who opt to live in an upmarket residential building. A neutral colour palette was chosen for the space, which is texturised via a mixture of matt white, veneer and marble-look porcelain. Stylish storage solutions were an important consideration when designing this kitchen and so Tekform drawers by Titus were ultimately chosen. These drawers come in two colour options, white and anthracite grey, and seven widths, to suit most cabinet styles and sizes. Their thin side walls give the appearance of a clean, simple box drawer, while their ability to extend fully offers users easy access to the drawer’s contents. 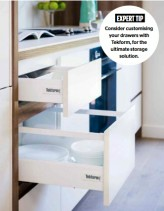 The drawers have a 40kg load capacity and can be customised with ease, in regard to size, height, rails and organisational inserts. The kitchen’s neutral palette, clean lines, sleek storage solutions and open-plan design work together beautifully to create the ideal space for metropolitan living. The bathroom of this newly built apartment was designed to be sleek, luxurious and trendy, while remaining highly functional. Two-toned cabinetry similar to that of the apartment’s kitchen was incorporated into the design, creating a continuity throughout the home. 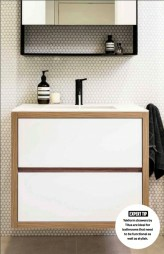 The bathroom’s vanity unit includes quality Tekform double-wall drawers by Titus, which boost the quality and functionality of the space. The full extension range of these drawers makes it easy to access their contents, which have a 40kg load capacity. The drawers are ideal for every bathroom space as they can be easily customised when it comes to size, height, rails and organisational inserts. The Penny round mosaic tiles featured on the walls give the bathroom a subtle touch of understated elegance, while creating a contrast to the clean lines prominent in this space. The room is highly textured, with a mix of matt white and Navurban veneer; this, combined with the sleek black taps and accessories, creates a luxurious, modern bathroom space perfect for those who crave a metropolitan lifestyle. Designer: SJB Interiors for Hawkfine Joinery and TRIO Construct. What Pantry is Right for Me?